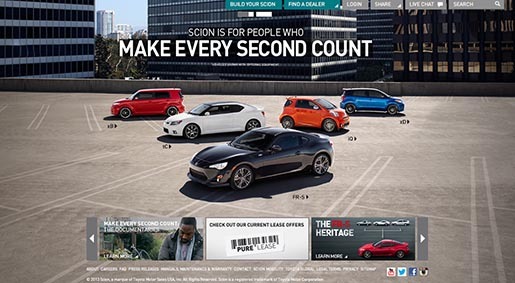 Automotive brand Scion is running “Make Every Second Count”, a cross-media advertising campaign featuring real individuals using Scion vehicles to pursue their passions. Documentary film maker Doug Pray has created a series of short documentary films showing how Scion fits into the lives of five young entrepreneurs, and how much their cars help them. The short films, online at scion.com, are supplemented with 30 second promotional spots and print double page print ads. The documentary subjects are music promoter, talent buyer and manager Travis Hayes Busse, bicycling activist and retailer Daniel Farahirad, filmmaker, entrepreneur and web personality Levi Maestro, food truck founder and owner Lisa Nativo and chef, author and activist Bryant Terry. Each was given a camera and mounted camera in their car to capture their everyday lives. 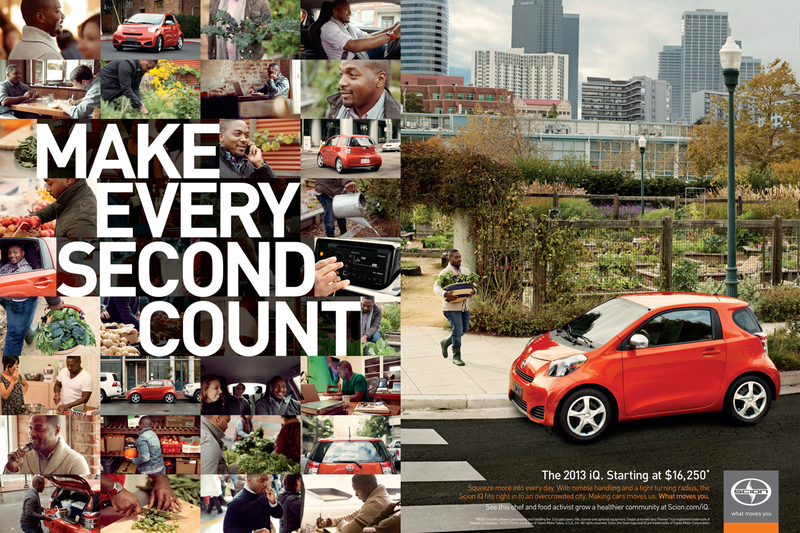 Scion iQ “Make Every Second Count: Bryant Terry” 30 second spot. 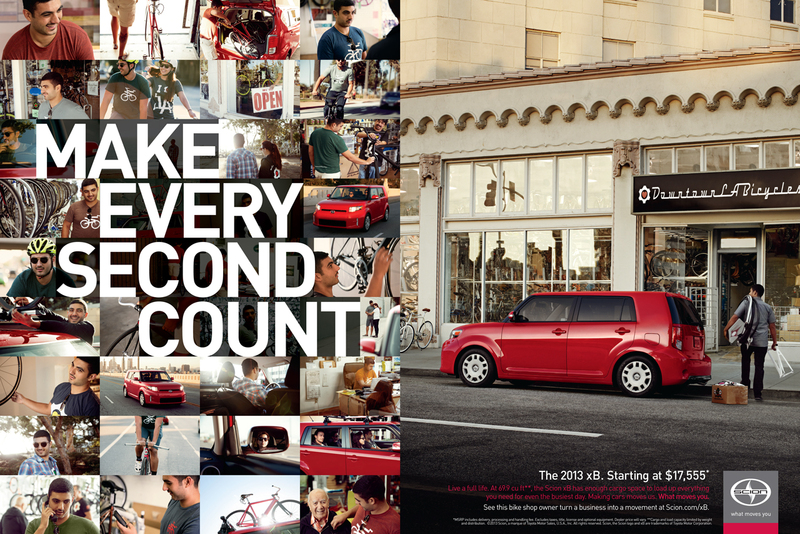 Scion xB “Make Every Second Count: Daniel Farahirad” 30 second spot. 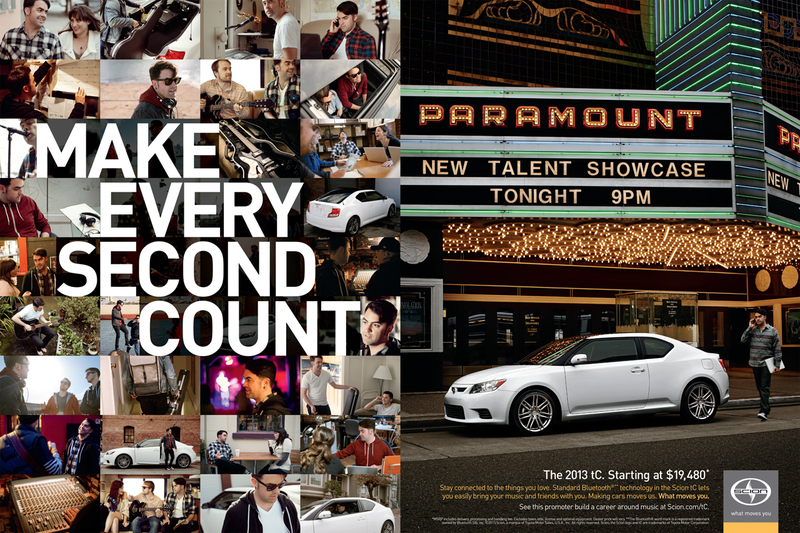 Scion tC “Make Every Second Count: Travis Hayes Busse” 30 second spot. Filmmaker Levi Maestro and how he has turned his passions into his career. Food truck owner Lisa Nativo is beginning to make her dream career a reality with her menu at Nonna’s Kitchenette. 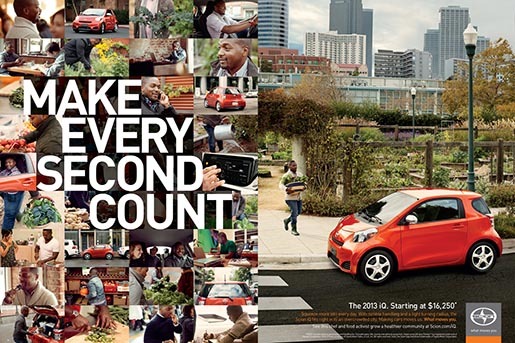 The Every Second campaign was developed at Attik by executive creative director Simon Needham, creative director Ron Lim, senior copywriter Mike Brenner, senior art directors Greg Coffin and David Ziganay, director of broadcast Patty Lum, interactive creative director Jacob Ford, account director Michelle O’Hea, senior account manager Sacha Zivanovic and planning director Tonia Lowe. Filming was shot by director Doug Pray via Bob Industries with executive producer T.K. Knowles and line producer Peter Murray. Editor was Philip Owens at Stitch Editing with producer Chris Girard.